HOTEL UPDATE – HOLIDAY INN GROUP BLOCK SOLD OUT! WE RECOMMEND BOOKING AT THE SANDMAN, OR AN AIRBNB … READ ON FOR DETAILS! Both our initial and additional discounted group blocks of rooms at the Holiday Inn are now SOLD OUT. General hotel rooms during summer are now averaging $450/night CDN to start – to everyone who took advantage of our group blocks and scooped up rooms for $200-250/night, it may have seemed expensive then compared to cheaper cities, but you got a screaming deal as hotels are now averaging $200 more per night across Vancouver for all but the lowest 1-star hostels. Though not as famous as those cities, Vancouver is on par with London and New York for hotel demand and pricing in summer. But don’t despair! There are still options! We ALSO secured a discounted group rate at the Sandman, a higher end hotel just a few blocks away from our main host hotel at the Holiday Inn, which was originally higher cost than the our main host hotel, but now is actually $100 LESS per night, now that the main host hotel has sold out of our discounted rooms and has jumped up to regular market price. Additionally, the Sandman offers many higher-end amenities, such as ocean view balconies, and in-suite jacuzzis! Scroll down to the Sandman booking section for full details on how to book at this hotel. Located right in the heart of the bustling and kink-friendly Davie St gay village, it’s an easy 3-4 block to walk over to connect up with friends at the Holiday Inn, and make use of the shuttle services we have there for the Monday Beach trip & more. In the absence of being able to find an affordable hotel, we suggest you try to find an AirBnB! Scroll down to the AirBnB section on this page for booking links, and for a list of suggested neighbourhoods. Call the hotel directly at 604-681-7263, or send in an email (listed below), making sure to quote the group name and/or group reservation code. PLEASE NOTE – On the main night of VFW, Saturday July 28, it’s fireworks night, and the surrounding neighbourhood around the Sandman is closed to vehicle access from 7-11:30 PM, due to mass influx of people walking into the area to view the fireworks from the nearby beaches. This means you cannot get a cab directly to the hotel on this night. However it is only a short 1 1/2 block walk to the corner of Davie & Burrard, where you can easily hail a cab, as many people will be getting out of them on this corner, heading to the fireworks. IF YOU WAIT TOO LONG AND THE HOTEL SELLS OUT – WE SUGGEST AIRBNB! The hotel sells out FAST, and people always wait to long and end up looking for places to stay at the last minute. If this is you, we have some suggestions for you! In mid-July, with heatwaves and amazing weather coursing across Vancouver, and excitement ramping up further every single day for Vancouver Fetish Weekend at the end of the month, we get overloaded hearing from many people who only just started looking for places to stay and discovering WE AREN’T KIDDING when we say Vancouver is in high demand in summer. Once the host hotel is SOLD OUT of our discount block, regular rooms jump by over $100/night, and go for well over $325/night, which is absolutely standard across Vancouver – IF you can even find a room! Most places will already be booked out, with rooms being scarce and hard to find at all! At that point we highly suggest trying AirBnB – rates can be very reasonable, with amazing places to stay in downtown Vancouver, close to all the action of VFW! Head to the website, see what you can find, and make sure to refine your search to the areas we suggest. We highly suggest staying in one of the following areas listed below. They are all downtown with access to everything you will want. Everywhere else is an outlying suburb of the city! Refine your AirBnB search to these Vancouver neighbourhoods – and good luck! We are pleased this year to offer not one but TWO discounted hotel options! Our two hotels are located just a short 3 block walk from each other, both in or on the edge of the vibrant Davie Village neighbourhood of downtown Vancouver. Close to many shops, pubs, restaurants, nearby beaches and bike ride routes, and a short walk or cab ride to all our event venues. You can cancel at either hotel up to 48 hours beforehand for a 100% refund so there is no risk if you don’t end up needing it – and you will want to lock in having the option, as Vancouver is EXTREMELY in demand for hotels in summer, with hotels across the city selling out well in advance and NO ROOMS BEING AVAILABLE ANYWHERE. Outside of our discounted block, prices jump by over $125 PER NIGHT if you miss out for just a regular run-of-the-mill hotel room, IF you can even find one. By comparison, average prices for bare bones hotel rooms in summer in Vancouver go for $325+/night. Compare to our discounted group options … and again … RESERVE YOUR ROOM ASAP! Don’t say we didn’t warn you! Read on for booking info, and keep going for more info on the hotels, and even further for more options for what to do if you miss out on the group booking. to book, making sure to enter ‘VFW‘ in the group code box, or call or email the hotel directly. The Holiday Inn is our main and mid-range host hotel, offering rooms from C$198 / US$158 per night. The hotel has indoor parking, an indoor pool, gym, spa, restaurant & more. 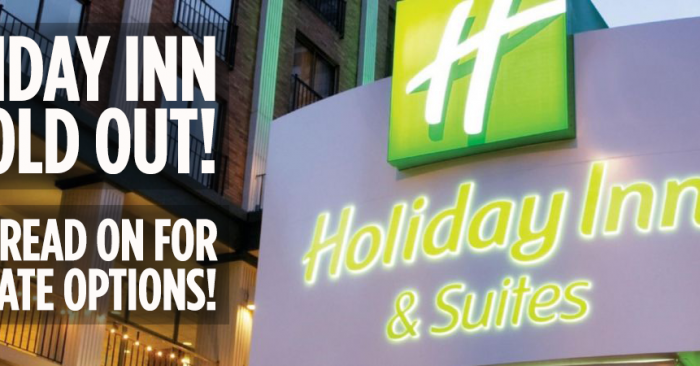 * Please note – our discounted room block at the Holiday Inn is now SOLD OUT. There are still rooms available if you still wish to book at the Holiday Inn, but they are at full market rate, currently $450+/night.